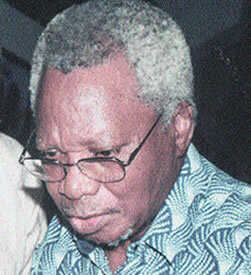 J.P. Clark has been one of those principal Nigerian poets whose works have been studied far and worldwide. He was born in Kiagbodo to Ijaw parents in 1935. He schooled in Nigeria till his first degree in English from the University of Ibadan and then went on to work both at UI and then later at the University of Lagos. While in these two places, he was actively engaged in literary activity, being founder of the student poetry magazine The Horn at University of Ibadan, and also coeditor of the literary journal Black Orpheus when he was lecturer at the University of Lagos. Clark studied a year at Princeton, after which he published America, Their America (1964), which was a criticism of middle-class American values and black-American lifestyles. His works also included Poems (1962) and A Reed in the Tide (1965), His Casualties: Poems 1966–68 (1970) which talks about the Nigerian civil war, Decade of Tongues (1981), State of the Union (1985, as J.P. Clark Bekederemo), and Mandela and Other Poems (1988). He wrote and published plays as well. As one of Africa’s leading authors, he has continued to play active roles on literary affairs even after retirement, resulting in his receipt of the Nigerian National Merit Award for literary excellence in 1991. Howard University published his two definitive volumes, The Ozidi Saga and Collected Plays and Poems 1958-1988. He held visiting professorial appointments at several institutions of higher learning, including Yale and Wesleyan University in the United States. The poem reviewed here below is one of his most studied. This poem should not be confused with another of the same title by Wole Soyinka, the other Nigerian great. The title of J.P. Clark’s poem is a store of meaning for the poem itself since it gives us understanding of many of the sentences we will encounter in the poem. The word Abiku is Yoruba for ‘spirit child. It refers to a child who must die and repeatedly be reborn again and again. So, Clark is talking to one of these Abiku. The poem opens by Clark sounding a denouncement to this Abiku who probably has just been reborn, for ‘coming and going these several seasons’ (line 1) to mean that he gets born, and when the family thinks that he is here to stay, he dies. And he does it several times so that Clark seems so fed up as to tell him to ‘stay out on the baobab tree’ (line 2). In Ghanaian cultural tradition and I should suppose same for Nigerian too, the baobab tree is suspected to be the meeting place of all manner of spirits, witches and wizards who work at night. This is because the tree is usually huge, grows tall and has thick shrubbery that gives it a mystical look especially at night. By asking Abiku to stay out on the baobab tree, Clark is asking him to stay in the spirit world and not be reborn. In the third line, Clark emphasises this by asking Abiku to ‘follow’ where he pleases his ‘kindred spirits’, which gives a sense that Abiku keeps coming and going from a community of like-minded spirits. This should be so, as Clark says, if ‘indoors is not enough’ for Abiku (line 4). Indoors refers to normal life among men when Abiku brings joy at birth, only to bring sorrow at death soon after. Clark goes on to explain the modest conditions in which they live, if perhaps that is what keeps Abiku going away. He confesses that it ‘leaks through the thatch’ (line 5), a roof of grass and straw used as matting for a poor home built usually of clay, when it rains till ‘floods brim the banks’ (line 6). At night also, bats and owls tear through the eaves (lines 7-8), making sleep difficult. Then when the dry harmattan of the West African dry season comes, the bamboo support of the house is torn down to make fires on which the poor fish caught for the household is dried up on the rack (line 9-11). Maybe Abiku keeps going because he is born into a poor home. Clark makes this excuse and still insists that Abiku should stay out nevertheless because regardless of how poor they are, the house is the ‘healthy stock’ (line 12) to many more people who are born and stay, and others more who ‘reach to the sun’ (line 13). I will translate this reaching to the sun to mean that they grow up, each growing taller bringing them vertically closer to the sun. Abiku never stays long enough to grow up. Clark continues that Abiku should make up his mind, no longer should he ‘bestride the threshold’ (line 14), meaning he should no longer stay with one foot indoors and the other out on the baobab tree; an indecision between life and death, this world and the other, ‘but step in and stay. For good’ (line 15-16). Henceforth, Clark mentions a few things we will need to understand by understanding the culture of Yoruba. When an Abiku comes and goes a couple of times, a frustrated family gives the Abiku scars at birth so that being now made ugly, it will displease the gods and spirits to have him return to the spirit world. This makes the child stay alive and end the sorrow of the family that is burdened to bear that child over and over. Clark says that they can see and ‘know the knife scars’ (line 16) running ‘down [his] back and front’ (line 17), ‘like beak of the sword-fish’ (line 18). They have made their mark on him so that when he has now been reincarnated with those scars, they recognize him ‘as a bondsman to [their] house’ (line 20), having also ‘both [his] ears, notched’ (line 19). In pastoral communities, cattle owners use ear brands and notches to indicate which cattle belong to them. These notches look like huge, coloured earrings on which specific alphabets or even the colour, serve to identify one man’s cattle from his neighbour’s. Clark says that these very evident marks are ‘relics of [Abiku’s] first comings’ (line 21). They are not mistaken; they know him as the one. Finally, Clark tries to convince Abiku to ‘step in, step in and stay’ (line 22), for the woman who bears him is now ‘tired’ (line 22) of his many reincarnations and so tired that her milk now is ‘going sour’ (line 23). This souring only happens to milk that has grown old and we will assume this to mean that the woman is now growing too old to keep up with Abiku’s treachery and may no longer have a strong body to bear him. Clark tries to make it not sound so bad, by saying that it is with this same milk that ‘many more mouths’ (line 23), presumably of those other people who stay and ‘reach to the sun’, have ‘gladden[ed] the heart (line 23). Which heart? The hearts of the family which have not hurt because these other people lived on and also the hearts of these ones who lived on to gladden themselves with the milk of this woman’s breast! This is a great poem by all standards and there is no doubt why it is one of Clark’s most studied. Beautiful review. I studied JPC’s Abiku in secondary school way back and your review is par! Well done, Dela! Thank you for the compliments, Celestine. I love this poem from JP Clark and I should be lining up the other by Wole Soyinka for review soon too. Thanks for coming by and commenting, Kayode. its is such a good analysis but should be followed by the figure of speech and themes in the poem. Thanks Lateef. I have intentionally not done literary analysis of the poems I review because that will make the reviews too long, and is really just so much tedious work for each poem. I’m just doing my bit to help people come to a better understanding of the poetry they read, that’s all. Thanks for coming by. amazing review.one of my favorite poems in secondary school.you couldn’t have given a more beautiful insight. Thanks for compliments, Bett. Looks like this is one poem many people loved after studying in high school too. kudos to you! I can understand the work better. I had plans to review Soyinka’s Abiku until I decided to review different countries every other time so Nigeria will have to wait in line a bit. The themes in this poem should be online. Please see what results Google returns to you. what a wonderful review, it made no sense to me initially but after going through the review, i can now say i have a very clear understanding of this great poem. Thanks for feedback, Samuel. I’m glad my review helped your understanding. That’s the reason for it all. ABIKU is one the poems of JP CLARK I read fervently. The diction and use of other literary devices like figurative particles is a masterstroke. And the review is a masterpiece. Thanks alot i now understand the poem more than ever. Good analysis there. Keep on the good work and never rest on ur oars in d world of literary appreciation. Beautiful review. Erupts a kind of nostalgic feelings in me; and Sends my mind racing back to my secondary school days in the 80s. What a simple and interesting analysis.The analysis was so understandable . Nice work but I need the poetic devices and the themes. I can imagine the nostalgia. Thanks for stopping by. JP Clark has given us a poem here to cherish forever. Good work Dela. Am an artiste and I don’t know how to get my biography published for google search. Please someone should help me review my own Abiku written for Muhammudu Buhari. Do I not pity for you? Have you no tears to mourn me? Please someone should help me review my own Abiku written for the Nigeria’s President. I STUDIED THE POEM “ABIKU ” BY JP CLARK IN HIGH SCHOOL AND I ALSO PROUDLY ACTED THE PART OF THE WISE OLD MAN ON THE PERFORMING STAGE DURING OUR INTER-HOUSE COMPETITION AT QUEENS COLLEGE LAGOS IN 1984. ANOTHER STUDENT WAS ACTING THE WOLE SOYINKA`S POEM ALSO TITLED “ABIKU” AND I WAS RESPONDING TO HER BOASTING OF HER POWER IN MY POEM. OF COURSE, OUR HOUSE, OBONG HOUSE, WON THE COMPETITION THAT YEAR. I WILL ALWAYS BE PROUD OF MY PERFORMANCE THAT NIGHT. What a wonderful reviews you made on this poem”Abiku by J.P.Clark”.Nice job done! I would like to know you better Mr Dela will it be possible? I remember the Abiku Child and the legacy of JP Clark so well. It is a literary work rich in Africa’s way of life. You review is like a splash of waters washing away the webs of forgetfulness. Wao this is great. Your analysis has made me to understand the poem. God bless you darling. Nice one but there is one Yoruba man abiku av 4gotten d name,but if u can get it 4 me will be lovely. Your review of ‘Abiku’ by John P. Clark is awesome and very explicit that I now understood the poem and the pains of those families into which an abiku is born. Just like in the Igbo culture, Abikus are same as Ogbanjes. Thank you so much for your time and clear review. hale and hearty yesterday, now corpses today. I love this poem by JPC. Thanks for your analysis. In our custom or tradition when a child is born and dying several seasons the remedy to that occurrences is tribal Marks on the new born child to prevent repeatation of mourning in that particular home.